The Aloha shirt is the quintessential symbol of Hawaii. Cool, comfortable and casual, Aloha shirts are perfect for that Sunday beach barbecue, a night out at the movies, or just lounging around, making them perfect almost any time on the islands and a great way to remember paradise when you're back home. Luckily, if you're planning a trip to Hawaii, you won't need to look too far once you've arrived—or even in the airport on the way there—to find some great deals on these souvenirs. 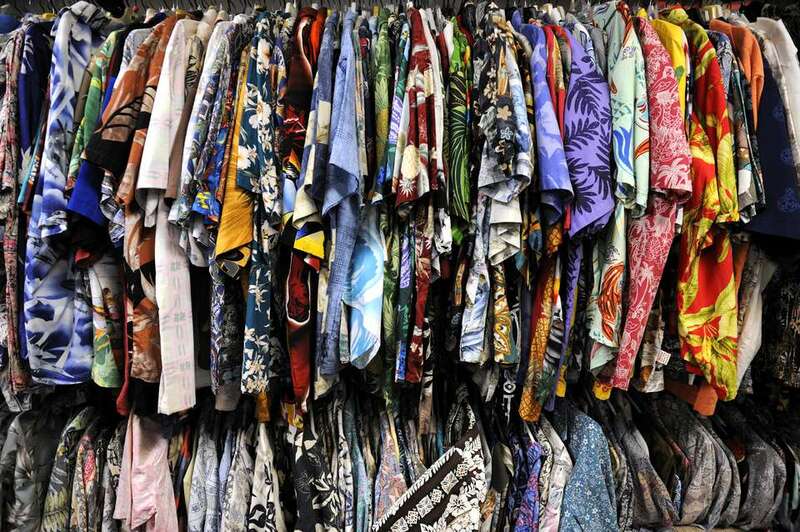 From small beachfront shops and kiosks to airport clothing stores, there's no shortage of places to get Aloha shirts. However, if you want to find the best Aloha shirts Hawaii has to offer, make sure to stop by one of these great island vendors so you can wander around Hawaii's many beaches in one of the tourists' favorite fashion accessories: the Aloha shirt. One of the top places in the world to buy a vintage aloha shirt is at Bailey's Antiques and Aloha Shirts located at 517 Kapahulu Avenue in Honolulu. Founded in 1980 in Honolulu, Bailey's has the world's largest selection of aloha shirts (over 15,000) and is now doing business on their website as well. With four categories to choose from—used, new, vintage, and specialty—there's really no better place on the island to browse this Hawaiian souvenir. Tori Richard brings Aloha shirts into the midrange fashion industry with a huge selection of the highest quality shirts on the islands. They even make a great Aloha polo shirt which is hard to find, but well worth it when you do. With five locations in Oahu, three in Kauai, two in Maui, and one on Waikaloa, there's no shortage of places to find this great retailer—or you can visit their online store (linked above) if you want to buy one before you head to the islands. The "Store of Hawaii" has emerged from bankruptcy and is now owned by Royal Hawaiian Creations. They offer numerous patterns of aloha shirts in several different materials and price ranges. With numerous locations in Oahu, Maui, Kauai, and the Big Island, Hilo Hattie has been serving the Hawaiian people and its visitors for over 50 years, offering a wide variety of island wear, gear, and specialty foods. Reyn Spooner is one of the most respected makers of fine Hawaiian wear offering over 60 patterns of the classic Aloha shirt to tourists and online shoppers alike. First introduced in 1964, Reyn Spooner's Aloha shirts boast as the first to bring tailored fits to the classic style and all of their shirts are made from 60 percent P​ima cotton and 40 percent polyester. Offering over 80 classic Hawaiian aloha shirts in 100% cotton, rayon, and blends, Banana Jack shirts are "made in Hawaii and shipped with aloha." Banana Jack first opened in 1996 and has since operated as a family-owned business catering to locals and online shoppers alike. Be sure to check out their flagship store where you might even run into the owner on the island of Oahu. Owned and operated by Hawaiians now living in California, this seller offers a wide selection of shirts by Avanti, Go Barefoot, Kamehameha, Royal Hawaiian Creations, Winnie Fashions and more. Although there's no longer a physical store for this great company, you can browse hundreds of Aloha shirts in their online store. Offering award-winning patterns, the Kamehameha Garment Company is one of the oldest and most highly regarded manufacturers of Aloha shirts in the classic, purely retro, style. Kamehameha Garment Company boasts as being the originators of the Aloha shirt, or at least the first ones to call it that, and have recently come out with an 80th-anniversary specialty Aloha shirt modeled after the original 1936 version. Offering a wide selection of ​high-quality shirts including the widely demanded "Magnum P.I." shirt pattern actually worn in the long-running TV series, Paradise Found is a great destination for visitors of Honolulu to grab one of these popular shirts. Formerly known as Paradise Found Hawaiian Shirts, the company rebranded in 2016 and now includes products from a variety of vendors including many on this list like Kamehameha Garment Company and Banana Jack. Don't Forget the Thrift Stores! Scattered across the islands are numerous thrift and second-hand stores, especially in Waikiki on some of the side streets. As you wander past these stores keep your eye out for racks of aloha shirts, and while some of these shirts will likely be cheap knock-offs, scattered among the shirts you may very well see the legitimate labels of one of the top manufacturers which we have identified. For as little as $5 you may find a shirt worth much more because it is no longer in production—these are some of the best bargains and souvenirs that you'll find on your Hawaiian vacation. Meaning and Use of the Hawaiian Word "Aloha"